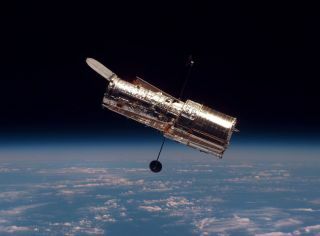 The Hubble Space Telescope, shown here in orbit, changed how humans see the universe. A new documentary tells the amazing story of the Hubble Space Telescope, which marks 25 years in orbit this Friday (April 24). Hubble blasted off aboard the space shuttle Discovery on April 24, 1990, embarking upon an incredible mission filled with disappointment, drama, redemption and innumerable discoveries. Now, NOVA's "Invisible Universe Revealed," which premieres on PBS Wednesday (April 22) at 9 p.m. EDT/8 p.m. CDT, takes viewers on a journey through the instrument's eventful life. "The story of Hubble is a story of discovery," the documentary's narrator says in the opening minutes. "It's also the story of one of the biggest blunders in the history of science, and of the genius and courage that saved the day. Now, on Hubble's 25th anniversary, NOVA tells the remarkable tale of how this magnificent machine was built, how it has solved some of our most enduring mysteries and how it is showing us a universe as beautiful as it is astonishing." Astronauts also repaired and upgraded the Hubble Space Telescope on four additional servicing missions, the last of which occurred in 2009. Hubble has been in on some of the biggest astronomical discoveries of the last quarter-century. For example, the telescope's observations helped researchers determine that the universe's expansion is accelerating rather than slowing down, and revealed that supermassive black holes lurk at the heart of most, if not all, galaxies. Hubble, a joint effort involving NASA and the European Space Agency, has also brought the beauty and wonder of the cosmos into laypeople's lives in a way that no other instrument ever has, mission officials say. "The universe is so much more accessible now to everyone than it had ever been before Hubble was launched," Hubble Mission Office head Ken Sembach, of the Space Telescope Science Institute in Baltimore, told Space.com. "I think that's the lasting legacy."